KINSHASA, 14 Jun 2006 (IRIN) - The Democratic Republic of Congo (DRC) is set to hold its first series of elections in 45 years on 30 July. There have been many obstacles and delays: The country is huge, with few roads, and is in the process of emerging from a decade of civil conflict; the army and the United Nations peacekeeping mission, known as MONUC, are still battling various armed groups for control of territory in the east; the main opposition party, the Union pour la Democratie et le Progress Social (UDPS), is not participating in the elections; and the powerful Catholic Church has voiced strong concerns about the way the elections are being conducted. QUESTION: Can you give us a status report and tell us how you think the election process is going? ANSWER: We are preparing the first round of presidential and parliamentary elections for 30 July. Concerning logistics, we have a lot of the electoral material ready. We are now preparing the list of candidates for the provincial elections. We will have a definitive list in June and will then announce the date of the second round of presidential elections and provincial elections. The other issue is the voter list, which we are in the process of preparing. We will make the list available 30 days before the [first round of] elections. We will have 11,201 voting centres and 46,693 voting stations. We are starting to recruit people to head each of these stations and will then train them. They will then train the staff working under them. Q: Are you not worried that the main opposition party for the last 26 years, the UDPS, is not participating in the elections? A: How does it work in other countries if political parties won't participate? What do you do? You first of all have to consider if the party was excluded or if it excluded itself. The UDPS demanded that its supporters boycott the registration of voters, but the law says that voter registration is a personal obligation [of all Congolese citizens]. During the registration period, I met with UDPS to make them aware of the law. I told them that they have the right to boycott other electoral processes but they do not have the right to incite people to go against the law. Then, after the registration period closed, UDPS changed their minds and decided that they wanted to take part in the process, so we had discussions with them. We had to make them understand what was still possible. They insisted that we reopen voter-registration centres around the country. That was not possible. The operation has so far cost US $153 million. If we accepted to extend the process all around the country again, we would have to buy new electrical generators for the registration centres because the generators we have are already broken. We would have to get fuel for the generators for another three months. We would have to recruit census staff again and transport them around the country by helicopter because this country doesn't have any roads. Even if a donor were to agree to give the money for all that, it wouldn't have arrived the same day. It would have taken at least another year. We would have also needed another six months to check the accuracy of the list. If we had accepted UDPS's proposition, we would have been delayed to at least 2007. Q: So none of the UDPS supporters who boycotted the registration process had a second chance to register? A: All we could have done at that stage was allow the candidates of the UDPS to register to vote. It is a requirement that a candidate must be a registered voter. But for even registering candidates, the UDPS had a problem that the government needed to settle and that took too long. Dissidents from the UDPS party, led by [Frédéric Maliba] Kibassa, were trying to claim the right to take the party's name. The eventual solution - as we had thought it would be right from the beginning - was for Kibassa's party to be called UDPS-Kibassa, as distinct from UDPS, which is led by Etienne Tshisekedi. That solution was found before the registration of candidates closed, but I was contacted by MONUC, saying that there are parties that want to extend the period for candidates to register, and I accepted. Thus, the electoral commission has done everything possible for the UDPS to participate, but the party was not satisfied and set conditions that were not possible for us to meet. Q: We have heard allegations from various circles, including from people working for the electoral commission, that the electoral process is not fair and transparent. How do you respond to such allegations? A: It is a problem of ignorance. Many people do not read the constitution and the electoral law and do not understand the situation. If they were to understand, they would see the situation differently. For example, the law says that the voter list should only be published 30 days before the elections. Therefore, I am unable to publish it before then. They should also know that the law says that the electoral commission must decide the calendar. We have had consultations with many groups, but some of them insist on negotiations. There can't be negotiations - there can only be consultations and then a decision must be made by the independent electoral commission. Another misunderstanding is [the electoral date of] 30 July: They say that the date goes beyond [the deadline laid out in] the transitional constitution. But since 18 February, there is a new constitution, and it states in Article 258 that the constitution of the transition is no longer valid. You can't refer to a constitution that is no longer valid as the basis for a political debate. The new constitution is what people chose, and you have to respect that. Q: What about allegations that there is a lack of transparency? A: We have put in place mechanisms [for transparent elections] that are known by everyone, and we have consulted with local and international experts before making the decisions. For example, we have an Internet site on which we put the results of the referendum and other information, such as the list of candidates. Every time there is a decision we also put it on the website. For the referendum, we gave each party a CD-Rom with the provisional voter list on it. We have also chosen a transparent voting system. Now, to avoid problems with the results, the voting station will also be the place where the votes are counted. Thus they can file the results as soon as the counting is finished. We have decentralised the system of compiling the results. We are going to have 64 result centres so that we can verify the results at every level. We have also decided that journalists, local and international observers and observers from political parties can take part in all the operations. People say we need political dialogue. Indeed we want that dialogue, because the new constitution calls for dialogue on a permanent basis. But with regard to the electoral commission, this dialogue already exists. The commission is organising a forum of political parties and candidates. We are going to listen to the different participants and give them the information they need. We have the same dialogue with civil society, representatives of the church and with the institution of the republic. But you speak of transparency, and you should not confuse the work of the electoral commission with the political debate between the opposition and those in power. Q: The Catholic Church has played an important role in bringing about these elections. You are a Catholic priest, yet increasingly clergy are speaking out against the electoral process and calling for it to be renegotiated. How do you respond? A: There is no problem with the church. The church is very involved in programmes for civic and voter education in the country. It has created manuals on civic education that we are distributing and has trained thousands of people on civic education. I can really say that the church is united. I think the problem is that there are individuals who understand the church incorrectly, because they hear an opinion of someone in the church and they radicalise it and interpret the [electoral] law in their own way. If someone in the church says there should be dialogue, does that mean he rejects the process? No. Does that mean he questions [me], the head of the commission who is a priest? No, not at all! The advantage I have is that I have a bishop in Butembo, who I rely on, and he is in contact with other bishops, and there is no problem between us. On the contrary, democratic debate can continue without creating a problem in the church. There has been a bad interpretation of the words of a particular man of the church, but, in fact, the church continues to participate positively in the electoral process, and it has fixed principles by which all the priests and lay people can participate. Q: Another problem is the ongoing unrest in the east of the country. Does that not make it difficult to hold credible elections? A: Security is important, but one can look at the issue in two ways: Firstly, if the negative forces in the country were allowed to destabilise the process it would encourage them more. But you do need to have a minimum level of security to hold elections. Therefore, we need to put pressure on [the armed groups that threaten the process]. We have a security plan, which cost $50 million, led by the national police and supported by the newly integrated brigades in the army, as well as MONUC and now a European Union force. Still, the big question is: How many army brigades will have been integrated by the time of the elections, and how well will they be able to control any tension created by elections? Q: Many people are cynical about these elections, saying they will not change any of the problems in this country. How do you think the elections will change things? A: Currently, everyone says they are important and that they speak on behalf of the people, but what people we do not know and on what basis - this we don't know. The elections can resolve the crisis of legitimacy. 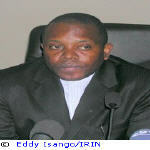 But the crisis in Congo is not just a crisis of legitimacy. There is a crisis of governance; there is a social, economic and cultural crisis. So what is the purpose of this election? For people to choose their leaders and to put an end to the transition, which in fact has lasted 16 years since the era of [ousted President] Mobutu [Sese Seko]. The country is isolated diplomatically and has been abandoned by its own people. After elections, people will still have to fight for democracy. The government must respect the constitution. They will have to meet the needs of populations and fight against poverty. So elections are a starting point, not a point of arrival. After organising these elections that are seen as credible, we will have to fight for regular elections in the future. Eventually, it will make leaders accountable, knowing they will have to keep coming back to the people in order to get elected.